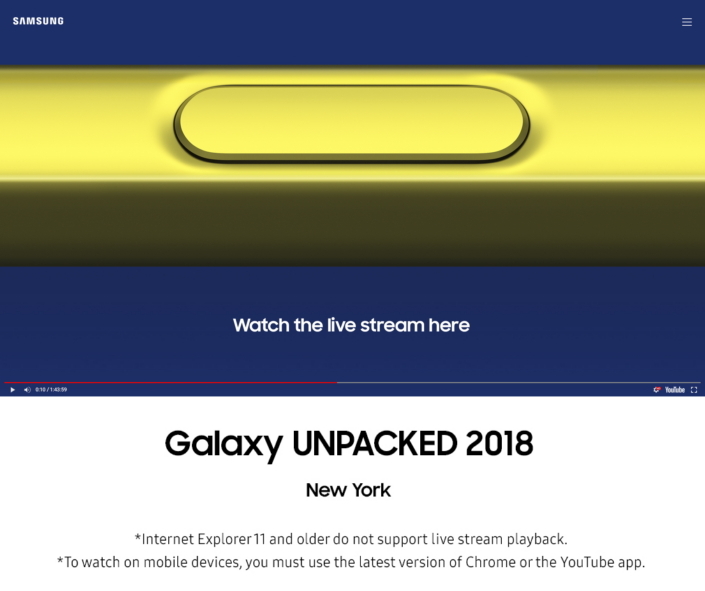 We’re just a day away from Samsung Galaxy Unpacked 2018 in New York City, where Samsung Electronics will introduce the newest addition to the Galaxy family. A device designed for those who want it all and demand the best of the best. If you can’t make it to Brooklyn’s Barclays Center for tomorrow’s big event, you can still watch the action unfold live by tuning in on August 9 at 11 a.m. EDT via any of the links listed below. Visit Samsung Newsroom, Samsung.com or Samsung Mobile Press when the event begins. Visit Samsung Newsroom or Samsung Mobile’s Facebook page when the event begins. Visit live.twitter.com/Unpacked when the event begins. And don’t forget to check out Samsung Newsroom’s Galaxy page for all the latest updates on the lineup’s newest addition.